“When the Blackbird Says ‘Bye-Bye’ (and the Bluebird Says ‘Hello’).” Words and music by Art Noel and Don Pelosi (1940). Recorded by Elsie Carlisle with orchestral accompaniment under the musical direction of Jay Wilbur on December 31, 1940. Rex 9904 mx. R5204-1. Elsie Carlisle – "When the Blackbird Says 'Bye-Bye'"
British songwriters Art Noel and Don Pelosi co-wrote a good number of Elsie Carlisle’s later songs: “Little Drummer Boy,” “Kiss Me Goodnight, Sergeant Major,” “A Mother’s Prayer at Twilight,” and “Nursie, Nursie” are among them (and Art Noel made still further contributions to Elsie’s songbook). 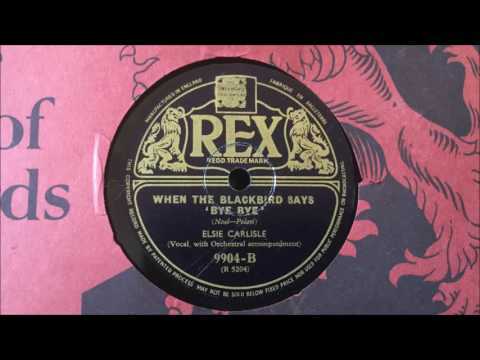 “When the Blackbird Says ‘Bye-Bye'” is a particularly beautiful representation of what the British music industry could turn out even during the dark months of the Blitz. The song’s theme of blackbirds departing and the apparently preferable bluebirds appearing does not appear to me to refer to ornithological facts about changing seasons. It is, rather, to musical tradition that we must look for the roots of this upbeat theme of better times and happy reunion, to the 1920s songs “Bye Bye, Blackbird” and “My Blackbirds are Bluebirds Now,” which also use breeds of birds to represent changing moods and fortunes. The incredible sweetness of Elsie Carlisle’s later recording voice comes through nicely on this Rex record, which suffers from somewhat less “crackle” than the label was famous for. It is is quite satisfying to aficionados to hear Elsie reprise her famous theme of “The Clouds Will Soon Roll By” at 1:26. The orchestra is not identified on the label and the precise personnel is unknown, but the violin is particularly memorable. “When the Blackbird Says ‘Bye-Bye'” was also recorded in 1940 by the New Mayfair Dance Orchestra (under the direction of Ronnie Munro, with vocals by Sam Browne), Geraldo and the Savoy Hotel Orchestra (with vocalist Jackie Hunter), Lew Stone and His Band (with Sam Browne), and Joe Loss and His Band (in a “Quick-Step Medley”).